How can anyone not love a title like that? It’s from the New York Times, May 23, 1854, p. 4. 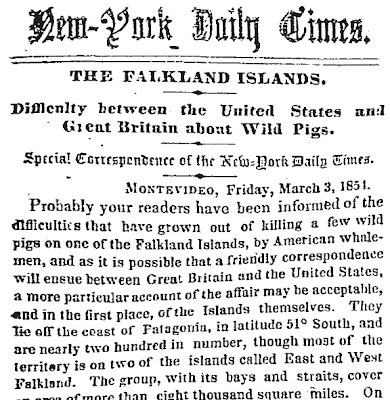 The story explains that American whalemen had killed a few wild pigs on one of the Falkland Islands and that England and America were at a diplomatic breaking point over the incident. According to the article, American fishermen had stocked the islands with hogs thirty years before, and hunted them for food when they were fishing in the area. The French had introduced cattle to one of the islands with the same purpose. The problem now arose because the British crown now claimed possession of the Falklands, and all the animals on them. In February 1854, the commander of the H. M. S. Express arrested the captains of two American vessels for the crime of killing thirty wild pigs the previous year. He took the captured fishing schooners to Port William, where apparently the ships were to be sold for the value of the pigs and to pay the fine for the crime of killing the animals. The effort was a fiasco, it seems. The American consul at Port William called over a warship from the coast of Brazil; the trial revealed that no one really knew who was where, when, and what laws applied anyway (the only longstanding rule on the books was against killing “cattle, &c.,” forcing the prosecutors to try to argue that a “wild pig” fell under the “&c.” part of that rule). It wasn’t even clear how many pigs had been killed. Ultimately, one of the American captains was fined, a cost he paid under protest. The English are trying to do here what they attempt everywhere they get an opportunity. They bluster and bully, and claim what they please to, and if their claim is admitted very well—they will then negotiate, and let you, for a handsome consideration, enjoy what was your own before. The message of the crisis is also clear to this historian: Why on earth isn’t maritime history more popular? Admittedly, the death of a few wild pigs might be of enormous historical significance itself, but looking into it does suggest that there is a whole world of history out there that isn’t getting the attention it deserves. The crisis over the pigs illuminates on ongoing contest between the claims of landholders and fishermen to resources, a contest that stretched throughout the nineteenth century and that was key both to the construction of nations and to their interactions with other countries. The Falkland Islands, for example, changed hands so many times in the eighteenth and nineteenth centuries that when I looked up their history I stopped trying to keep track. 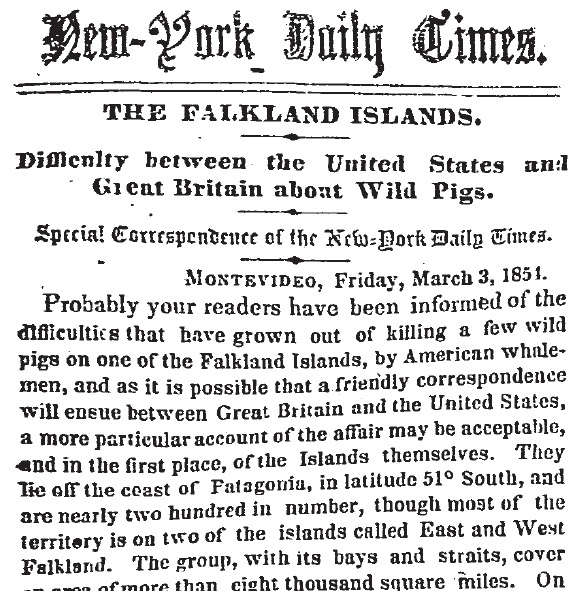 And a leading American newspaper highlighted the story of the wild pigs and interpreted it as a major development in the nation’s relationship with England. Politics and economics only begin to dip into what we can seine from maritime history. What about the environment? Wild pigs do enormous damage to the land, as scientists in Hawaii have documented. How did whalemen change local environments by turning them into commissaries? What about communication networks? The same page of the newspaper that yielded the pig story has long columns listing all the ships that had sailed, been seen, or been contacted in the previous two months, their port of call, what they carried, and where they were at the time. It also mentioned collisions and damage to ships. A scholar using GIS could recreate these voyages, and with them the world of maritime trade. It seems to me likely that interest in maritime history took a dive when the turn-of-the-century expansionism and nationalism of Alfred T. Mahan fell into disfavor. But the fact that early practitioners took their studies in a direction that is no longer popular is no reason to ignore the history of human interaction with what amounts to about seventy percent of the earth’s surface. Anya Zilberstein and Lisa Wadewitz have recently done some of the work you suggest, particularly in Pacific history. But I agree, more maritime history = good. Also, I wouldn't purge "nationalist" and expansionist perspectives in maritime history just yet--what about Walter McDougall's _Let the Sea Make A Noise..._? It may not be Mahan, but still. It fell into disfavour? It's alive and flourishing lustily I would have said: the programme of study at Exeter under N.A.M. Rogers continues to amaze and confound with what they produce. Helen Doe's work on women in the ship-building industry during the Napoleonic wars has been ground-breaking. The refit of the Mary Rose Museum in Portsmouth carries on apace. The historic dockyards there themselves aren't far behind. And the Inshore Squadron who study Nelson's tactics have come up with revelatory discoveries in the last decade. I fancy like all history or specialist history, maritime history appears to be marginalised--particularly by mainstream publishers. Whereas there used to be shelves of books on Nelson and Wellington too, now there's only half a shelf for the pair of them in the bookstores. What is really interesting is how it nearly came to war between the two countries. The Americans sent out their own gunship that tried to 'liberate' the detainees and was only prevented by the brave actions of the commander of HMS Express in a much smaller ship!